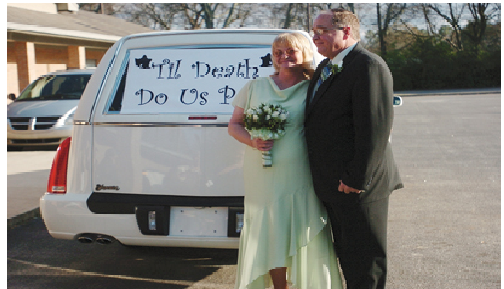 “Til death do us part” has new meaning with funeral home weddings. Wedding days are usually well planned events full of flowers, guests and celebration. People can spend years planning and saving for that big day. Expenses for even a modest wedding can put serious strain on a relationship and your bank balance. Finding the right dress, flowers, band and venue are important decisions for the bride and groom. Lately, weddings are being held in non-traditional locations and Brendan Spaar has heard of a location that is one to remember. Most of us have been to weddings and agree that for the most part they’re pretty much the same. The bride looks lovely, the flowers are pretty, the groom looks nervous, and the guests can’t wait to celebrate at the reception. Imagine the look on the invited guests’ faces when they open their wedding invitation and read the location for the happy day is a funeral home! It definitely shoots this wedding to the top of the “must attend” list. Starting your new life together where most lives end is becoming more popular. Funeral homes are often beautiful places with tasteful decor and that has a growing number of budget minded couples considering this as an option. Weddings are big business with costs easily $10,000 or more. Getting that special venue can be difficult and that’s where the funeral home has an edge. Revenues have been declining at many funeral homes since the population is living longer. Many of these facilities have reception areas that could easily be used for other purposes. This opens up more choices for wedding parties as well as bringing in much needed extra revenue for the business. The cost of a funeral home wedding is often quite a bit less than other venues and will definitely be a memorable setting. Brendan Spaar hasn’t heard of any funeral home weddings in Forsyth County, Georgia yet but it appears to be just a matter of time before the trend catches on there. So if wedding bells are in your future, you might want to consider adding funeral homes to your list of possible locations. And may you live happily ever after! This entry was posted in GA and tagged Brendan Spaar, bride, Forsyth County, funeral home, georgia, groom, wedding. Bookmark the permalink.